Seriously, TGIF. As you know from yesterday’s post, it’s been a rough week around here so I’m welcoming the weekend with open arms. I am headed back to Iowa tomorrow for Megan’s bachelorette party! (You know, that one wedding that Ryan and I are standing up for in July and I’ve mentioned several times). I’ve been working on some little surprises the past couple weeks for her big night, and I am simply looking forward to a reunion with some of my close college girlfriends and a girls night out. Megan, if you’re reading this, get ready! Wherever you are and whatever your plans are for the weekend, I hope you have a great time! Here’s some highlights from my week. 1. Ryan and I had not one, but TWO impromptu date nights last weekend, and both nights were spent at the movie theater. We saw Maleficient and Fault In Our Stars. I loved both movies, and I highly recommend them to everybody. If you’re a big Disney person (like I am), you really will enjoy the twist on the classic story of Sleeping Beauty. And, what can I say about the other one? You will cry – from both happiness and sadness – so don’t say I didn’t warn you. I’m looking forward to reading the book now! 2. 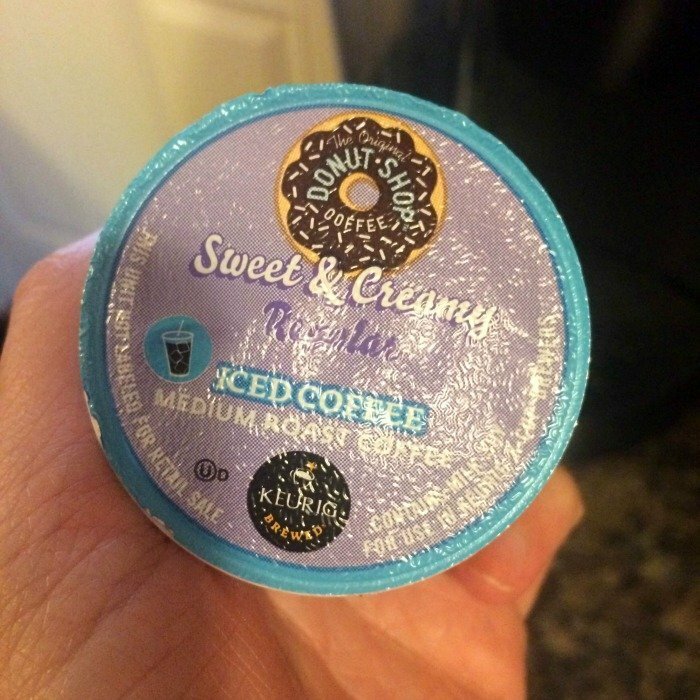 If you own a Keurig and like iced coffee, you MUST try this stuff. It’s perfect for summer when you don’t want hot coffee but still need a caffeine fix. I just fill up one of my mason jar mugs with ice and then brew a medium cup (the middle button). It’s so delicious. 3. 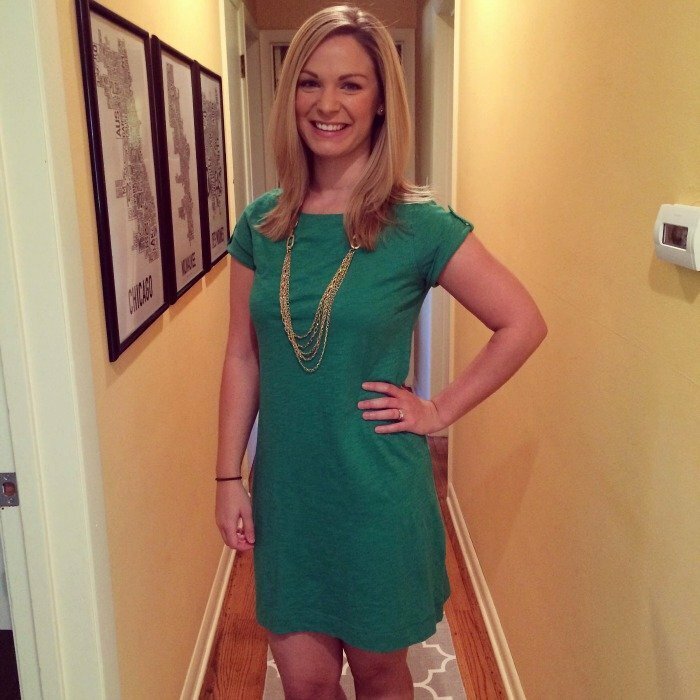 I seriously am having a love affair with this dress that I picked up on my last trip to the Banana Republic outlet. It’s great to throw on for running errands, but I easily could dress it up for dinner or a night out. 4. Well, I’m sure you can guess by this picture what I’ve been doing whenever I have a free moment. It’s my new guilty pleasure – I literally am hooked and can’t stop watching it! 5. I just want to take a quick second to wish all the dad’s out there a happy early Father’s Day, especially my own dad. I am the luckiest girl to have been raised by a strong and compassionate man, and I am thankful everyday for your support, wisdom and humor. I simply couldn’t do what I do (and try to do) without your encouragement and love. Thank you for being my dad! Yes, seasons 1-4 are on Netflix now. And, yeah for date nights! Right?! I'm almost done with season 4 on Netflix, and then I can start watching it weekly! It was a great weekend to recharge! My husband really enjoyed the movie, despite being surrounded by a bunch of crying people, so hopefully your husband will agree to go. It's a great movie! Thanks, lady! Let me know if you try the coffee – it's a winner in my book. Thank you! And isn't that coffee the best? I can't get enough. Ha, good plan to wait for it to come to Netflix! You could've heard a pin drop in the movie theater – everybody was sobbing! Hey, Kat! I'm so happy that you stopped over – I love meeting other bloggers that are in Wisconsin! I haven't read the book yet, but now I can't wait to! The movie was one of the best that I've seen in a long time. Love PLL! I started watching last winter and was hooked – I watched all of the seasons in like two weeks! And I still need to read Fault In Our Stars.. everyone is raving about it! Did you read the book, too? Pretty Little Liars!! I read today they they were renewed for a sixth and seventh season too.. Say what??!! lol. Have fun catching up!! Happy weekend! Hey Karly! Just found your blog through the link up with Lauren Elizabeth. I went to school in Milwaukee, and currently live in Northeastern Wisconsin… small world! I love that Banana Republic dress, and am looking forward to trying that iced coffee. Yum! Yum! That iced coffee sounds so good. I'm new to the keurig, so I appreciate the recommendation. I'm waiting to see The Fault in Our Stars until it comes out on DVD so I am not a hot, crying mess at the theaters! haha. I'm hooked on PLL too. Have a great weekend! Totally making one of those iced coffees when I get home they are my favorite! Loving that dress on you especially with the gold accents! Ooohhh thanks for the coffee recommendation! LOVE that dress girl 🙂 What a blessing to get 2 impromptu date nights! Have a great weekend! That iced coffee sounds super yummy! I so want to see Fault in Our Stars, I've heard from multiple people now to be prepared for tears, now I just have to convince my husband to go with me! I hope you have a great time this weekend, I'm sure it will help you to recharge to be with some of your great friends! Have fun! Love your wedding dress. Beautiful picture. Will have to try those K-cups. Hooray for Friday…and for a girls weekend! Have a blast with Megan! 🙂 I will be working on the giveaway for the blog! 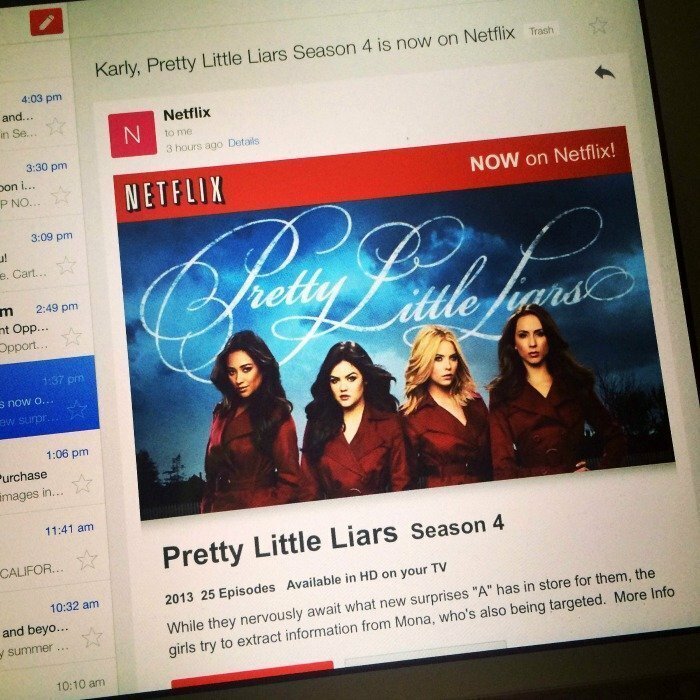 Oh I had no idea PLL was on Netflix now! Thank goodness!! And def want to see Malificient- maybe I'll get my own date night! Ha ha – if you do get into PLL, prepare yourself. You literally won't be able to stop watching. Have a great weekend!! Sleeping Beauty is my all-time favorite Disney princess – you should watch it! I think it's like 70 minutes. With that said, you definitely can still see Maleficient – you don't really need to have any background to get what's going on. I really think you'll love those Kcups! I rarely get excited about things like that these days, and I think they are scrumptious. That dress has been worn multiple times already, and I think I only paid $15 for it since it was their super sale item the day that I was in there – score! That's one of my favorite photos of my dad and I from my wedding – it was right before I started crying while walking down the aisle, ha! Okay, now we both have long comments. 🙂 Have a great weekend! I'm so happy that I haven't gotten into PLL – yet… Love the new dress that you picked up from BR – the color is really pretty!! Hope you have a great time at the bachelorette party this weekend! Happy Weekend! Thank you! The necklace is from Kohl's of all places – I wear it with everything. Thanks for stopping by! 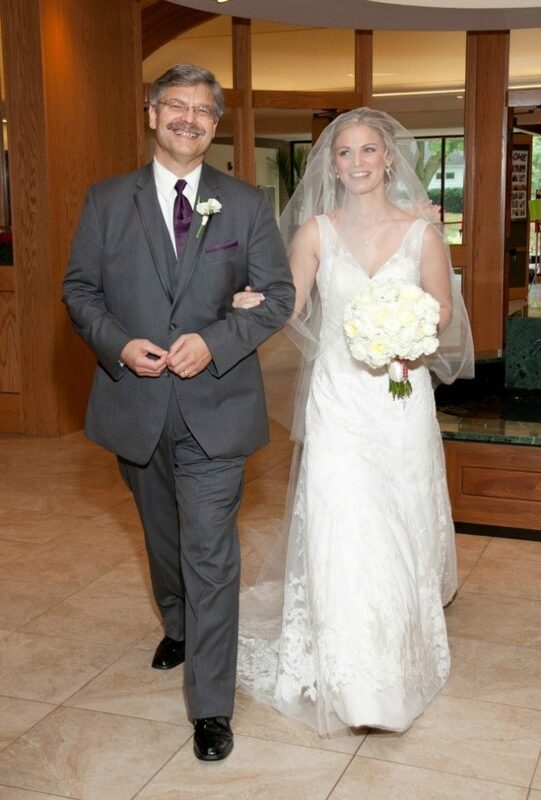 That's one of my favorite pictures of Dad and I from the wedding – right before I started my blubbering down the aisle! I actually think Sleeping Beauty is one of the Disney movies I never saw growing up! I kind of know the story, but for some reason I don't remember seeing it at all– that being said I still want to see Malificent- it looks like it was so well done! And yay for double date night! I'm going to look for those k-cups– anytime I buy any aside from the regular ones I use, I don't end up liking them and then I waste an entire box! I will trust your judgement though & give those a try because I love iced coffee 😉 I love that dress- that color is perfect for you! Outlet shopping is seriously the best- you can find such great things. That's such a great photo of you and your dad! Your dress is so gorgeous! And now that, that's the longest comment ever… I hope you have a great weekend! It sounds like it will be a fun one! That dress is so pretty on you! and I seriously LOVE that necklace! Have a great weekend! Love that picture of you and your Dad, brings back very happy memories! Have fun with your "girlies" this weekend! Yay for bachelorette parties!! And that green dress is so pretty!